The coverage on Fox & Friends (and America Live) regarding this topic is clearly a way to bash Obama and sow distrust of Obama, in the Catholic electorate, by claiming that Obama is treating Catholics unfairly. Wednesday, Steve Doocy, in "teasing" an upcoming segment, asked if Obama is "provoking a war against Catholics" and then got excited about their upcoming guest, a bishop who is "fighting Obama." In introducing the subsequent piece, Gretchen Carlson reported that religious leaders claim that the mandate violates their religious freedom. She introduced her guest, the ultra conservative Catholic bishop William Lori who, while defending religious liberty, opposes the liberty of gays to marry and women to have access to reproductive health services. He has required loyalty pledges from priests and has investigated wayward Catholic theologians. Gretch asked the bishop to explain the new law. Not surprisingly, the man in black began by stating that - wait for it - the policy violates Catholic religious liberty. He stated that the policy requires the church to provide abortion inducing drugs which is a Catholic position and not that of many other faith communities. The chyron framed the message "Battle Over Faith, Opponents Say Rule Violates Religious Rights." Lori explained the alternative and exemption to the policy which he claims, "penalizes" the church because it "forces the church to violate its conscience." Lori inadvertently stumbled onto the reason for the Fox News coverage when he said that the Church "wants to get the word out." Gretch concluded by saying that "some companies got health care waivers so maybe there'll be a waiver offered to the Catholic Church. FACT CHECK - the waivers are for restrictions on annual benefits caps. They're about dollar amounts and not about specific medications/services covered. But what's a few pesky details when you have propaganda to push? As the "church lady" would say, "isn't it special" that Bishop Lori had a nice platform from which to let the word go forth. But because Fox & Friends is "fair & balanced," I'm sure we'll see clergy representing Jewish and Protestant entities who support this health care policy which ensures that all women, regardless of belief, will have equal access to affordable birth control. Ya think? 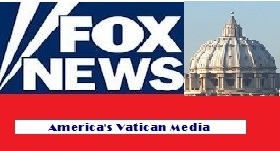 Dear God: Please put me in a coma and wake me up when Fox News is done with this phony outrage. Or find a way to make them realize they’re completely full of crap. Thank you. Priscilla wrote "While one can understand not having two opposing views in a segment, one would think that a “fair & balanced” programming format would include an opposing view at some point in time – or at least some rebuttal from the “fair & balanced” pals who routinely seem to be in agreement with their right wing guests." It’s stuff like this that the Fairness Doctrine required before it was ended by the Reagan Administration (which, not so coincidentally, led to the explosion in the far-right talk radio hosts). If the Fairness Doctrine were still in force in 1995, Murdoch and Ailes would never have been able to get their propaganda arm on television (except as a “premium” cable service like HBO or Showtime).